Yemerrawanyea was one of the two Australian Aborigine chiefs who came to England with Arthur Phillip, first Governor of New South wales, on his return in 1792. He was presented at court, but died later, in May, 1794, and was buried by the Well Hall Road wall to St John’s churchyard. (His fellow Chief, Benelong, returned to Australia and the promontory on which the Sydney Opera House stands, Benelong Point, is named after him). 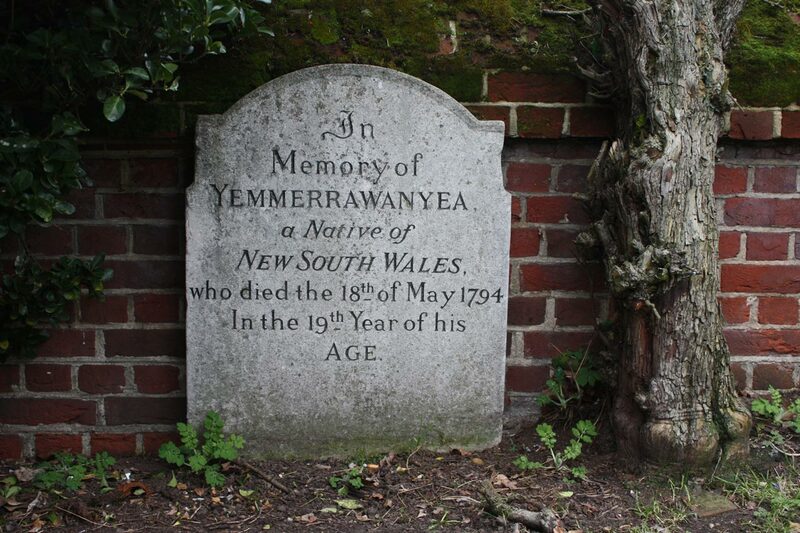 How did Yemerrawanyea come to be the first Aboriginal Australian to die in Britain and to be buried in Eltham in 1794, so soon after the “discovery” of Australia by Captain James Cook in 1770? The story is a sad one, told in detail by Jack Brook in “The forlorn hope: Bennelong and Yemmerrawannie go to England“. Yemerrawanyea and Benelong had become close to Admiral Arthur Phillip who was the first Governor of New South Wales, and founder of the settlement which became Sydney. They set off on the six month voyage to Britain with Admiral Phillip on Monday 10th December 1792, accompanied by “a couple of freed convicts, four kangaroos and several dingos“. Some saw the two men as samples to be examined in the same way as the flora and fauna of the new colony, though there were also thoughts that they could learn about British language and culture in order to aid relations between Australia’s indigenous peoples and the British. The two were treated well during their time in London; they stayed in the fashionable west end, and were bought sets of new, warm clothes suitable for gentlemen. Tutors in English reading and writing were provided, and they had the services of a servant and a washerwoman to wash their clothes. A programme of educational visits to the sights of the city, such as St Pauls Cathedral, was arranged, along with entertainment such the theatre. However it seems they weren’t presented at court, although many historical accounts claim they were. There is no record of them meeting King George III, the monarch at that time. Yemerrawanyea’s illness seemed to start with a wound or infection of his leg. His medical treatment seems barbaric to us today: it included laxative potions, bleeding, blistering, purgatives and leeches. Because of his illness both men left the city in October 1793 to stay at the house of a Mr. Edward Kent in Eltham, though where exactly this was is not known. They were looked after by a steward of Lord Sydney, whose family seat was nearby at Frognal House – where the Queen Mary Hospital is now. During the six weeks they lived in Eltham Yemerrawanyea and Benelong visited Lord and Lady Sydney at Frognal and got to know them well. They returned to London in November, but Yemerrawanyea continued to receive treatment. They moved back to Eltham in May the next year, shortly before Yemerrawanyea died of pneumonia. The vicar of the church, the Rev. JJ Shaw-Brooke, officiated at the funeral. Yemmerrawannie was buried as a Christian among the graves of the local residents of the Kentish village. 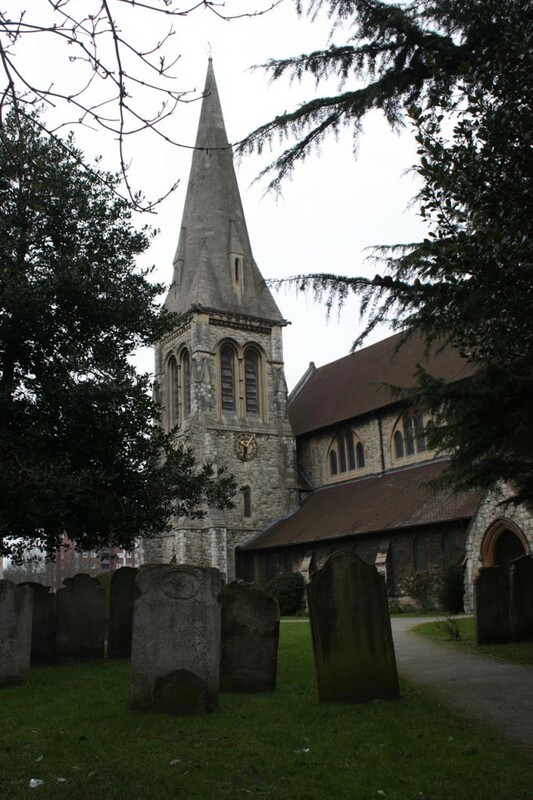 Eltham Parish burial register records: `May 21. Yemmorravonyea Kebarrah, a Native of New South Wales, died May 18 1794, supposed to be aged 19 years, at the house of Mr Edward Kent’. A sad end to Yemerrawanyea’s short life, 10,000 miles away from home in cold, dank England. Benelong lived in Eltham for a couple of months after the funeral, before starting on his long journey home. Bring Yemmerrawanne back to his land and people please. Let him come home.